The successful relationship between the Clipper Race and PSP Logistics is set to continue for a third consecutive race. We are very happy to announce that the global freight forwarder and international boat transportation company will return as a Team Partner in the Clipper 2017-18 Race, following campaigns in the 2013-14 and 2015-16 editions. PSP Logistics will also return for the fifth consecutive time as the Official Logistics Supplier. As well as providing general sea and air freight services to clients all over the globe, the British based PSP Logistics specialises in project shipping, which includes large out-of-gauge cargo such as yachts and wind turbines. “We are very happy to have PSP Logistics back, both as a Team Partner and Official Supplier, for the Clipper 2017-18 Round the World Yacht Race,” says Sir Robin Knox-Johnston. “PSP Logistics is a great example of a British business which operates globally and uses its Team Partner status to create new global opportunities. 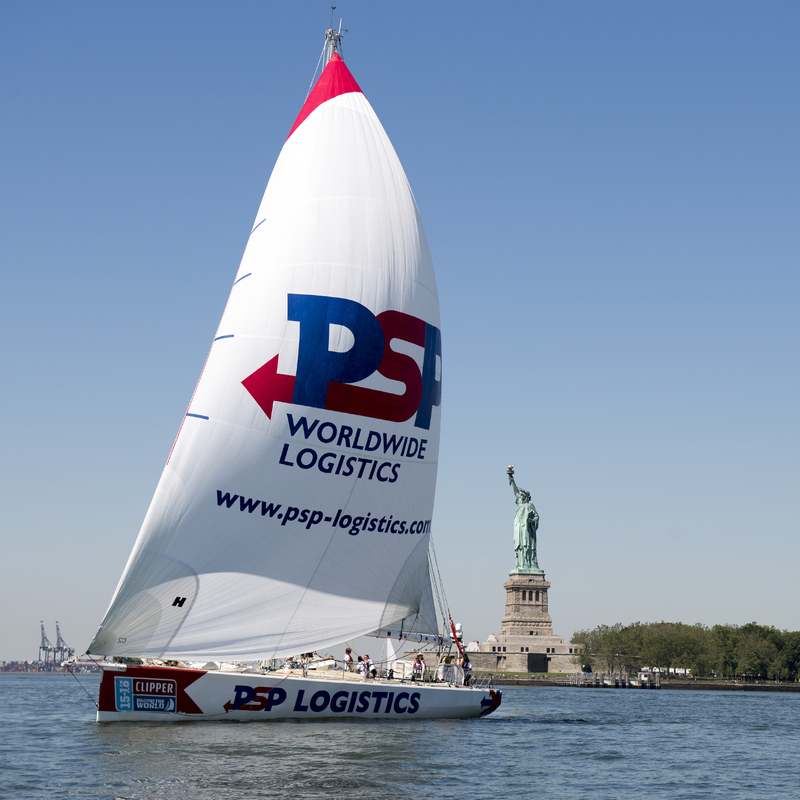 PSP Logistics in New York during the Clipper 2015-16 Race. The decision to become a three time Team Partner was an easy one for Frank Dixie, the Founder and Managing Director of PSP, who says the company just can’t get enough of the Clipper Race. “It’s the willingness to grab a challenge with both hands that aligns us with the race and makes us the perfect partner for its logistics,” says Frank. The Skipper for the PSP Logistics team will be unveiled shortly. There is still time to be a crew member on board PSP Logistics or one of the other eleven teams. Spaces for the Clipper 2017-18 Race are going fast, and applications are also now open for the 2019-20 edition of the race. If you think you have what it takes to race across the world’s oceans, apply here.